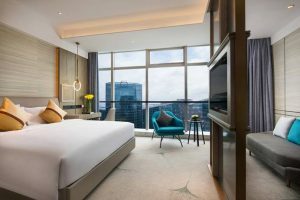 Radisson Hotel Group™ has expanded its collection of upscale Radisson hotels in China, with the opening of Radisson Ningbo Beilun in the thriving port city of Ningbo, Zhejiang province. Radisson Ningbo Beilun is a new-build hotel in the city’s Beilun district, a free trade zone close to one of China’s largest international ports. It is an integral part of a new mixed-use development, INSHOW City, which is China’s first maritime-themed commercial complex and features the city’s largest light show. The stylish 21-storey hotel also is strategically located close to commercial offices, dining outlets, retail malls, parks and a media broadcasting base. Connected to major expressways, Radisson Ningbo Beilun is just a 45 minutes’ drive from Ningbo Lishe International Airport. The hotel also provides easy access to attractions including Harbor Land Theme Park, Jiufeng Mountain, and other natural and cultural sights in Beilun district. “The city’s emerging industrial sector and the success of Ningbo International Port make Ningbo one of Asia’s most dynamic cities and a key business hub. Radisson, our international upscale brand, is a perfect fit for many of China’s fast-growing cities. We look forward to introducing local and international travelers to a new era of hospitality in Ningbo Beilun area.” said Gary Ye, Vice President, Operations, China, Radisson Hotel Group. Radisson Ningbo Beilun offers 230 guestrooms and suites, with ample work space and complimentary Wi-Fi providing a seamless work environment for corporate guests, while allowing leisure travellers to unwind and stay connected at all times. Guests are also offered a choice of dining options, with two restaurants, a lobby lounge and an executive lounge. Radisson Ningbo Beilun is a new leading local destination for meetings and events with two 800-square metre ballrooms backed with professional support and state-of-the-art audio-visual technology. “I am delighted to welcome our first guests to Radisson Ningbo Beilun. Our contemporary rooms, suites and facilities are perfect for all types of guest, including solo business travellers, couples, families and groups. Meanwhile, our extensive MICE facilities give us the flexibility to host a broad range of events, from small boardroom meetings to major events and weddings, putting the hotel in the heart of the local community,” said Max Xu, General Manager, Radisson Ningbo Beilun. The opening of Radisson Ningbo Beilun forms part of a major strategic expansion of the world-famous Radisson brand across the Asia Pacific region. This growth will focus on fast-growing cities in some of Asia’s largest and most populous countries, including China, India and Indonesia. Radisson Ningbo Beilun becomes the third Radisson hotel in Mainland China. The property also marks Radisson Hotel Group’s entry into Ningbo, which has a history dating back thousands of years to the days of the ancient Silk Road. As part of the modern-day Yangtze River Delta Economic Zone, one of the world’s most important industrialized regions, Ningbo is now playing a major role in the success story of 21st Century China.